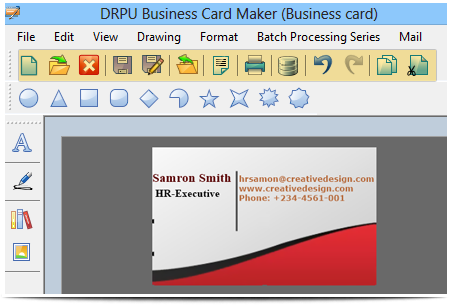 Simple and easy to use Business Card Maker Software provides methodology to design and create variety of business card in simplified way. Use the software to generate fully featured business card with advance barcode and photo addition facility. Advanced Business card designer program allows you to create and print professional looking business cards. Design business card with option to add photo. Design business card with option to add barcodes. Design business card with option to add message. Design business card in Rectangle, Rounded Rectangle, Ellipse or CD/DVD shape. ID cards designer software is useful to create variety of Identity card with use of advance barcode and photo addition facility. Identity card maker application generates ID cards using image designing objects like line, pencil, color, rectangle etc. ID Card Designer - Corporate Edition designs Student ID card, Visitor ID card, Healthcare ID card, Employee ID card, etc for multiple people using Live Group and Batch Processing mode. Using advanced print setting option, you can print your designed ID cards. Student ID Cards Designer Tool creates student ID cards with an option to export designed ID card as Image ( JPEG, PNG, BMP, etc ), PDF file and as Template. Software has inbuilt email setting feature to send created ID card at specified email address. Design and print multiple Gate Pass and visitors ID cards using Gate Pass Designer Software. While designing visitor ID card, you can save visitor's details to the database and export all visitor records in excel file. Easy to operate solution designs different type of cards and labels with use of advance featured card and label designer software. Application facilitates users to create badges, stickers, coupons of any dimension as per industry needs and requirements. Design colorful and attractive Birthday cards with use of advanced image designing objects in simplified and cost-effective way without any expert advice. Birthday card creator software facilitates users to design your own birthday card of any size or shape. Simplified solution to design and create different type of Greeting cards with use of variety of greeting card image designing objects. Greeting Cards Designer Software generates card for various occasions like New Year, Easter, Valentine, Friendship day etc. Logo designer software empowers you to create logo for different business organization. Logo generator program provides rectangle, diamond, star, pie, up triangle, down triangle and other designing objects to create professional logos or banner. Wedding Cards Designer Software helps you to design and print invitation cards in various shapes and sizes. Wedding card designer program provides pencil, line, text, ellipse and other designing objects to create invitation cards. Now you can easily create your own invitation card to invite guest on your marriage ceremony by wedding card designing program.